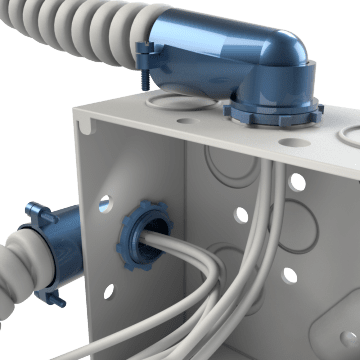 Connect flexible metal conduit (FMC) to knockouts in electrical boxes and enclosures at a 90° angle with these elbow fittings. Also known as 90° flex connectors, they help streamline conduit pathways in tight spaces and can be used to make sharp turns in areas with limited space. Often used to connect cable to motors, furnaces, and other appliances or equipment.